For those who are already keeping a tab of SBI exams must know that 8593 SBI Clerk 2019 vacancies are announced recently, which means that the SBI Clerk exam will take place in a few months from now. The SBI Clerk exam is reputed bank exam in India with more than lakh applications submitted each year. Here are some more details related to the SBI Clerk exam. The SBI Clerk Main exam is the final gateway to crack SBI Clerk exam. The SBI Clerk Main exam is a 200 marks paper consisting of 5 sections. Sectional timings apply to all the sections in the SBI Clerk exam 2019. Candidates need to focus on their preparation as well as time management or else they will fail to score good marks. 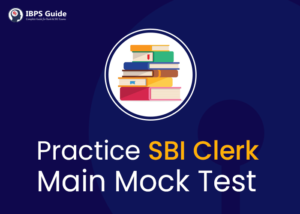 IBPS Guide brings you SBI Clerk Main Mock Test series which is designed specifically to provide candidates the guidance and right practice they need to crack the SBI Clerk exam 2019. The Mock Test series consists of 10 full-length mock tests which are accessible 24×7. Candidates can take the test in both English and Hindi languages. The SBI Clerk Main mock test series follows the latest exam pattern and is available at INR 220/- only instead of INR 299/-.